Howard The Duck is only one of a series of new adult animated series coming from Marvel and Hulu! Hulu and Marvel Television have launched a partnership to kick off a series of irreverent adult animated series, all focusing on some of the lesser known characters in the Marvel Universe. Marvel’s M.O.D.O.K, Marvel’s Hit-Monkey, Marvel’s Tigra & Dazzler Show and Marvel’s Howard The Duck will all follow the original Marvel Netflix model, with each series premiering before culiminating in a special event… Marvel’s The Offenders. Marvel’s Howard The Duck is trapped in a world he never made, but America’s favourite fighting fowl hopes to return home with the help of his unstoppable gal pal Beverly before the evil Dr. Bong can turn him the crispiest dish on the menu. 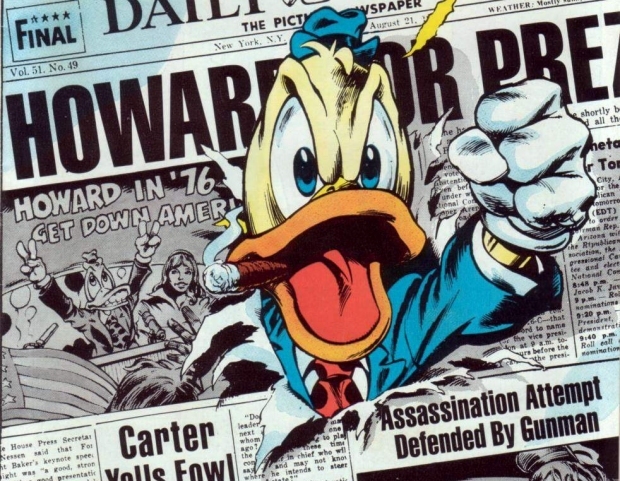 Created by the great Steve Gerber, Howard The Duck was an incredibly subversive comic in the 1970s, one that was far better, and way more ahead of its time than its peers. In the general pop culture landscape this has generally been obscured by the notorious failure of the 1985 movie adaptation. In more recent years, Howard had a cameo in the post credits scene of the first Guardians Of The Galaxy movie (where he was voiced by Seth Green…will he reprise the role for this animated series?) and a hilarious new comic by Chip Zdarsky and Joe Quinones. And here’s the official synopsis for MODOK, which comes from writers/executive producers Jordan Blum and Patton Oswalt. Marvel’s M.O.D.O.K. centres around an egomaniacal supervillain with a really big head and a really little body, who struggles to maintain control of his evil organisation and his demanding family. MODOK is the “Mechanized Organism Designed Only for Killing” (of course) and one of the stranger Stan Lee/Jack Kirby creations (and one of Kirby’s most distinctive visual designs). Hopefully Patton Oswalt will be providing the voice of the character, as well, but there’s no information out there about that just yet. And then there’s the Tigra and Dazzler Show, notable not just for the collaboration between Erica Rivinoja and Chelsea Handler, but also for being the first Marvel TV production that features members of the Avengers and the X-Men together. Not exactly the first Marvel/X-Men collaboration most fans were expecting, but still cool! And it all culminates with…The Offenders. Marvel’s The Offenders, is a story in which nobody asked them to — and we’d be better off if they didn’t — but MODOK, Dazzler, Tigra, Hit Monkey, and Howard the Duck are all forced to team up in order to save the world and certain parts of the Universe. Jeph Loeb will executive produce. Jeph Loeb will also serve as executive producer alongside the creative teams on all of the above shows. There’s no word on when the first of these will arrive, but if we’re lucky, we’ll get Howard The Duck before the end of the year. We’ll update this as soon as there’s more information.